We are nestled in rural Franklin County and centered in the Roanoke, Martinsville and Smith Mountain Lake area. 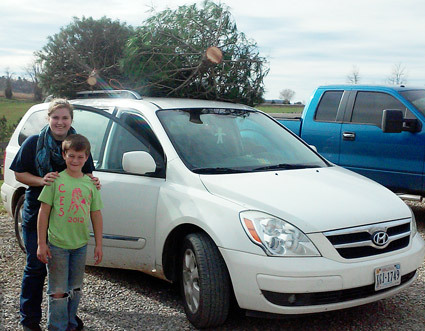 Yes, you can fit two trees on top of a minivan. Although farm life and our horses keep us busy year round, we look forward to Christmas time when we can offer visitors the opportunity to come to the farm and perhaps leave with something that will make their Christmas more enjoyable, even if it’s just the memory of the experience. We have many beautiful trees to choose from, but not a lot of taller trees. We have a variety of species, including White and Scotch Pines, Canaan Fir and Murray Cypress, and as always, we have several nice pre-cut Fraser Fir. Our Gift Shop creates a warm atmosphere for gathering, sipping hot chocolate and looking over our gift items and wreaths. White Horse Farm participated in the Virginia Christmas Tree Growers Association’s annual state-wide Tree and Wreath Contest and won First Place in both the Pine and Miscellaneous categories. 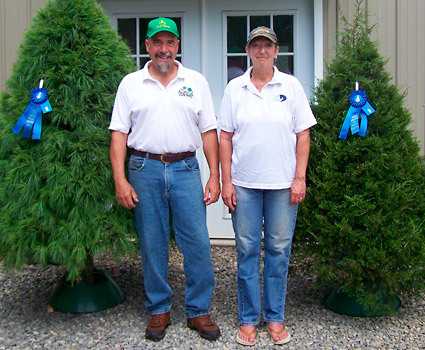 Pictured are our Blue Ribbon winning White Pine and Red Cedar. We also won the Third Place Yellow Ribbon for the Undecorated Wreath category. Please explore this site to see more of what the farm has to offer, and plan a trip to the farm this Christmas season. Hours: Saturdays and Sundays, 9 to 5, from Thanksgiving to Christmas (plus the Friday after Thanksgiving and on weekdays by appointment).